In a state known for doing things on a grand scale, it may come as no surprise to learn that Dallas is home to the largest contiguous urban arts district in the nation. And that at the center of the Dallas art scene is one of its grandest visions, the Dallas Omni Hotel. The Dallas Arts District encompasses some of America’s most distinguished collections, including several venues that offer Art for Kids programs: the Nasher Sculpture Center, Dallas Museum of Art, and the Crow Collection of Asian Art, among others. Dallas’ creative vitality is most evident outside of museums. In the Convention Center of downtown Dallas, a magnificent herd of longhorn cattle – captured in life-size bronze sculptures by Robert Summers – bisect Pioneer Park. Crossing the skybridge from the Convention Center, Omni Dallas may well be the city’s most ambitious arts project yet. 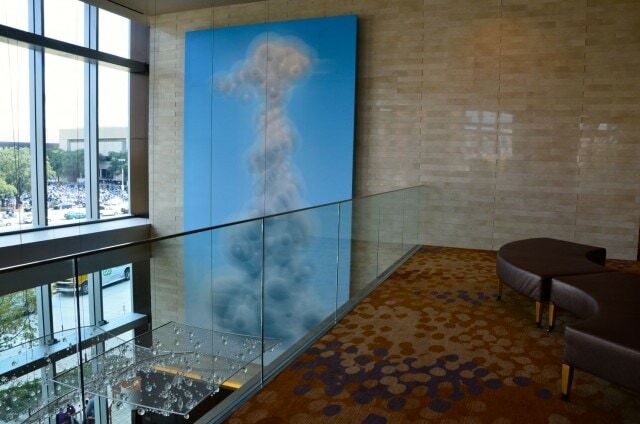 More than 6,500 individual pieces of art, from 150 local artists adorn lobbies, meeting spaces, and hotel rooms. When the hotel opened on November 11, 2011, Larry Hagman, the actor known for his portrayal of J.R. Ewing, the Texan tycoon of Dynasty fame, was on hand to cut the ribbon. A year later we found him strolling the lobby. Coincidence? Or serendipity? Larry Hagman is also a big supporter of the arts, most notably through The Larry Hagman Foundation, a non-profit organization that supports and promotes creative arts education for economically disadvantaged children in the Dallas-Ft. Worth area. Then again, on that same weekend, Omni guests ran into Jewel and ‘N Sync’s Joey Fatone. In a city that does things big, art is everywhere. Sandra–you have such a great voice in the video on the art! So soothing–you should look into doing voiceover work. 🙂 It was great connecting with you! Love your arts video! Have you ever thought of doing voiceovers or advertising? Your voice is made for it. Thank you for sharing the video of my and Larry Hagman. What a wonderful memory. Shucks, thanks! This is the first time anyone has complimented my voice, usually my kids have the opposite reaction.